Katherine Tegen Books, 9780062428202, 304pp. With a dash of Lemony Snicket, a dollop of the Addams Family, and a hearty dose of adventure, New York Times bestselling author Natalie Lloyd introduces a new series about seven strange and adventurous siblings who tackle problems together—even when their new neighbors try to tear them apart. 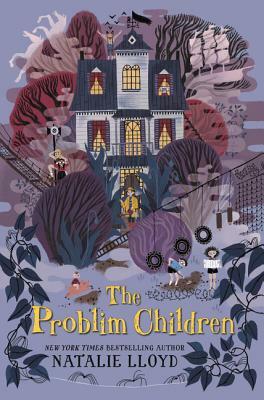 When the Problim children’s ramshackle bungalow in the Swampy Woods goes kaboom, the seven siblings—each born on a different day of the week—have to move into their grandpa’s bizarre old mansion in Lost Cove. No problem! For the Problim children, every problem is a gift! But rumors about their family run rampant in the small town: tales of a bitter feud, a hidden treasure, and a certain kind of magic lingering in the halls of #7 Main Street. Their neighbors, the O’Pinions, will do anything to find the secrets lurking inside the Problim household—including sending the seven children to seven different houses on seven different continents! Natalie Lloyd loves writing stories full of magic and friendship, including A Snicker of Magic, which was a New York Times bestseller, and the Problim Children books. She lives in Chattanooga, Tennessee, with her husband, Justin, and their dogs, Biscuit and Samson. “Filled with adventure, mystery, humor, and heart.